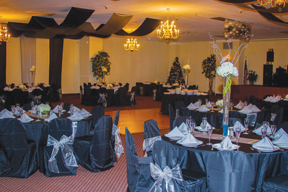 Wedding Reception 2013 – Ready? We Are! Our motto at Sherm’s Catering “No Event is Too Big or Too Small”. We are here to serve our clients and avidly follow all the breaking news and trends in the catering industry so we may offer you the best and most current advice on planning your event. Today I wanted to share with you some wonderful trends for wedding receptions in 2013. We are aware that every bride is on a budget, some larger than others, but the point is there is a way to achieve all of these things on YOUR budget. Talk with your caterer, check for availability – be creative together. You would be surprised what a caterer can do for you if you give him some time to bring the plan together. Plated Dinners versus Buffet Style: You got it! A Listers in Hollywood are leading this trend. They’re asking caterers for plated dinners on china with silverware, something more sophisticated. Spotlighting Your Culinary Heritage – more brides and grooms are proudly sharing their heritage by planning traditional dishes to both ethnic cultures and backgrounds. This trend is a natural conversation starter for guests who are meeting each other for the first time. Fully loaded with flavor and emotion, this trend adds an additional depth of personal touch to sharing a meal for the first time together as one family. Feature Entrée of the Year – Pork! More brides are serving pork at their weddings as a main course that veers away from the more expected beef offerings. They’re not looking for traditional pulled pork dishes, but a restaurant-quality creation for their event. Eye-Popping Cakes – The cake style that dominates right now is clean and modern with just one amazing pop of embellishment such as a bow, monogram or flower. The other major look takes the opposite tack, using eye-popping color or all-over appliqués. And finally, a traditional idea has come around again: Brides are loving cakes that mimic wedding-dress details like lace. Themed Drink Bars – With grooms getting more involved in planning, it only makes sense that a few more groom-centric ideas are creeping in. And those boys do love to plan a whisky bar, let me tell you! But don’t limit yourself. Martini bars are FABULOUS. How about a champagne bar, or a bloody mary bar, a fancypants beer bar, or a mojito making station? It doesn’t have to be alcoholic either – tea, coffee or hot chocolate are also a great addition! 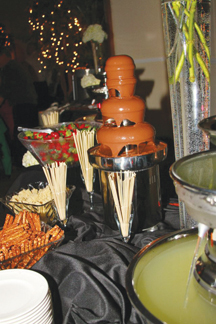 Dessert Bars – dessert bars are here to stay, but now they have a formal twist. Dessert bars by color. For example: White, do merengues, French macarons, fudge brownies topped with powdered sugar, and lots of desserts with vanilla-bean frosting. • Prescreen caterers at least one year in advance. Six months is cutting it close and you miss the chance to reserve your choice selection. • Schedule tastings at least 6 months in advance. 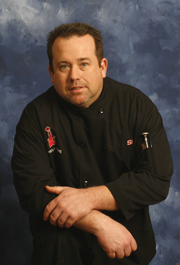 • A good caterer will request a deposit averaging between 30% to 50% of the cost of service. These deposits are NON REFUNDABLE, make your selection carefully. • Two weeks before the event, meet with your caterer to finalize headcount, review the menu, clear any questions or concerns (i.e. food allergies, children’s menu), special instructions day of (i.e. lighting candles). Congratulations on your engagement! We are here to help and can answer any question you have before you begin on the journey of planning your first official dinner as a married couple. We offer you our very best and sincere wishes for a lifetime of happiness. Cheers! Not everyone comes from a privileged background. Some people start from humble beginnings and get their education from the school of hard knocks. Sherm is one of those guys. He is not the type to cry and whine about his circumstances, he is more apt to fight his way forward. It’s just how Sherm is wired. Ask anyone of his friends, if they’re barbequing, running, or holding a tournament and they need his support, he is there. Sherm is also actively involved in corporate fundraising with Easter Seals, and is involved internationally through HelpPortrait. Locally, he partners with many other business owners to benefit charities in Delaware that spend their dollars only here in the local community. he seeks opportunities to better his community.